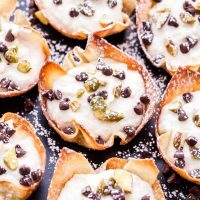 Pistachio Chocolate Chip Cannoli Cups are the easiest way to get your cannoli fix without all the work! 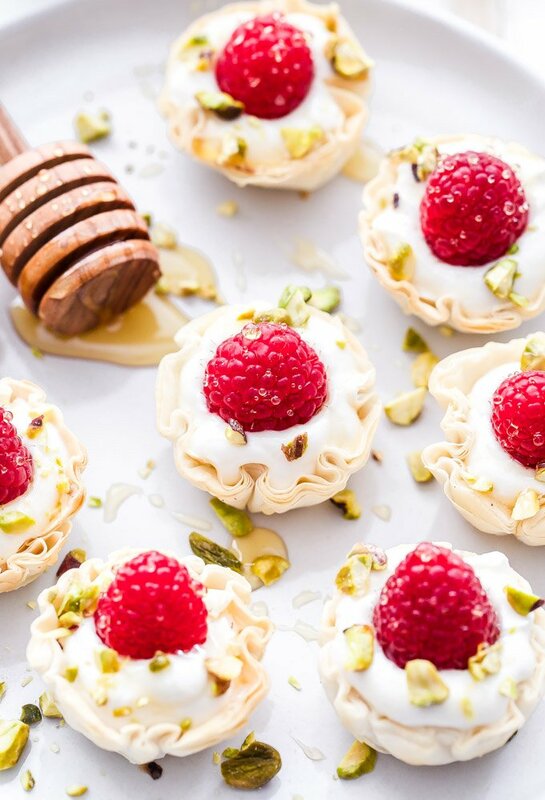 Made with lighter ingredients and baked instead of fried, they’re perfect for parties or any special occasion. Somehow it almost slipped my mind that Valentine’s Day is on Thursday. We aren’t really big into celebrating it, especially when it’s on a week day. I’m not a bitter, cold hearted person, but I feel like it’s a “holiday” mostly made for the card, chocolate and jewelry companies. It seems a little silly that we should feel obligated to go spend money and show affection on this particular day. Why not any/every other day of the year? 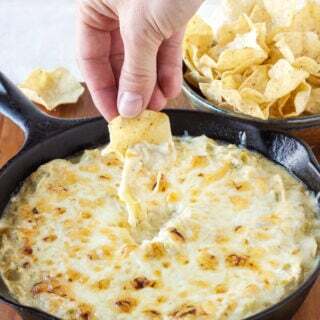 One thing I do usually do to make the day a little special is make my husband his favorite dinner (macaroni and cheese) and something for dessert. 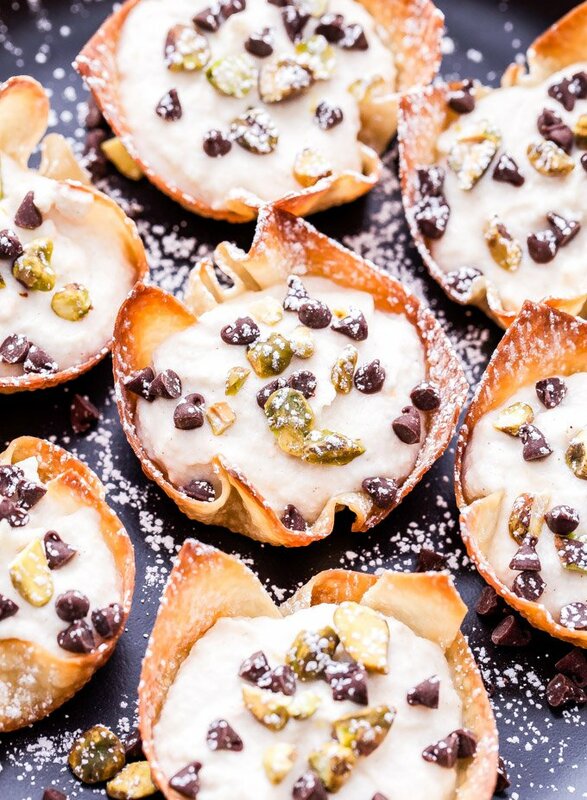 Since Valentine’s Day is on a Thursday this year, I’m making these Pistachio Chocolate Chip Cannoli Cups. They’re uncomplicated and easy to make, which is great because after a long day of work I don’t have much time or energy to put together anything elaborate. Elaborate isn’t in my vocabulary when it comes to making dessert. 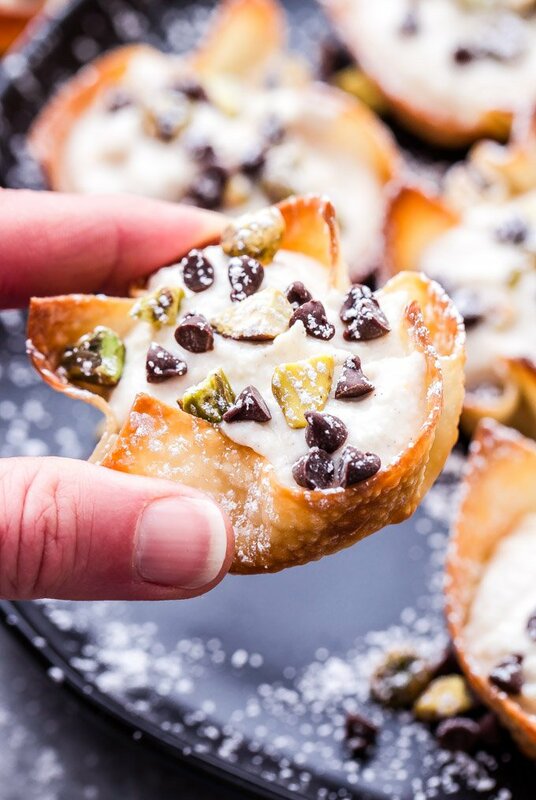 I decided to make these cannoli inspired bites in baked wonton wrappers. Obviously this isn’t traditional, but it’s a hell of a lot easier and healthier than making the dough for the shells and then having to fry them. Baking the wonton wrappers only takes about 10 minutes start to finish and you’ll still have that crisp crunch like you would with the fried shell. Cannoli filling is actually very simple and only uses a few ingredients. Usually it’s just ricotta cheese, powdered sugar and vanilla extract. There’s also a variation that includes mascarpone or cream cheese and yet another that is a cooked pastry cream filling. Since I was going for simplicity I went with the ricotta based filling with a few of my own additions. To give the filling a little extra flavor I added in ground cinnamon and orange zest. 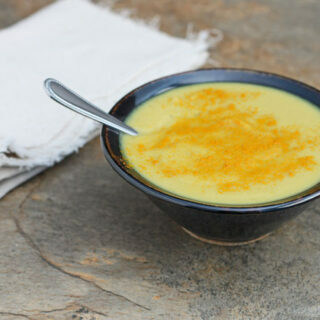 The flavors aren’t overpowering, but they add a hint of warm, sweet, citrus flavor. 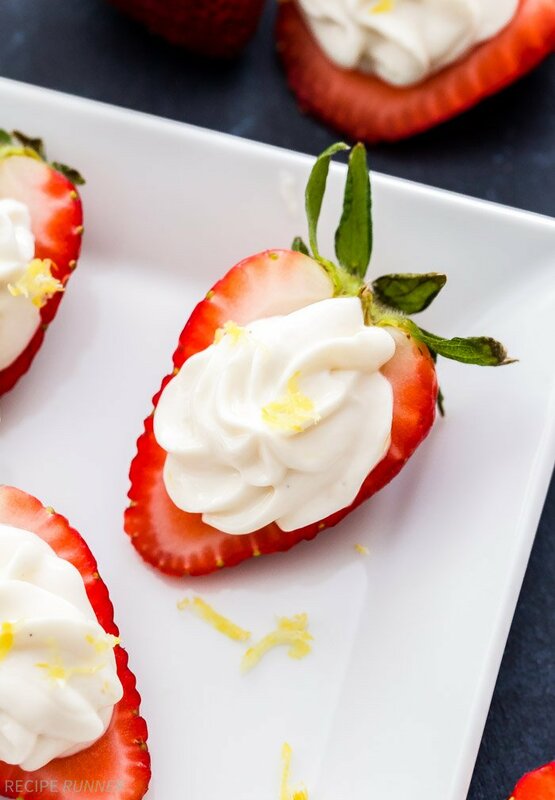 To keep the filling on the lighter side I used part skim ricotta cheese and combined it with plain Greek yogurt for a creamier filling. 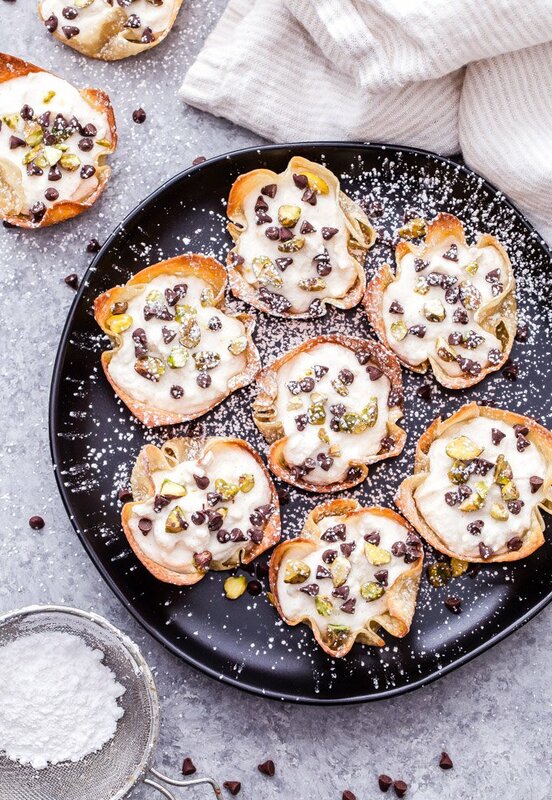 The filling goes into the baked wonton cups just before serving to prevent them from getting soft and is topped with mini chocolate chips and chopped pistachios. 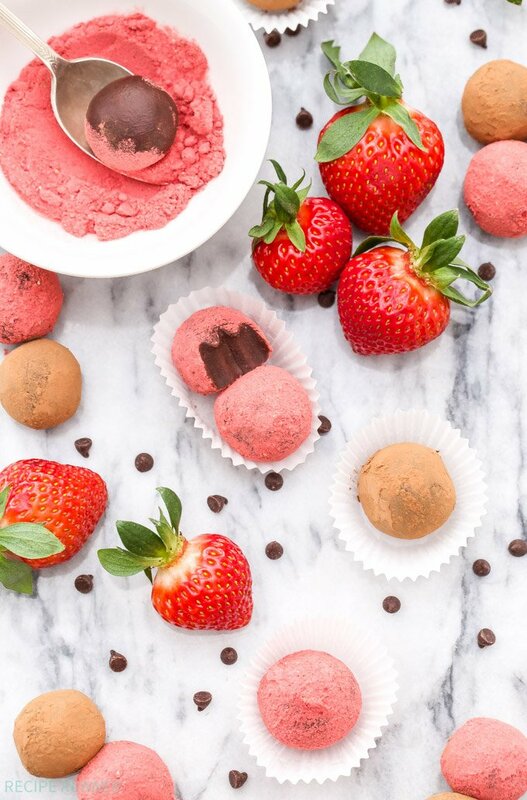 It’s the perfect two-bite treat to make for your Valentine this year! 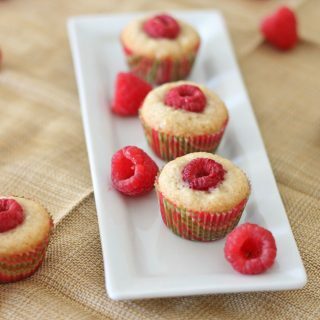 Preheat oven to 350° F. and spray a muffin pan with cooking spray. Place one wonton wrapper in each muffin cup and bake for 7-10 minutes or until lightly browned. Remove from oven and cool completely on a wire cooling rack. In a medium sized bowl or in the bowl of an electric mixer, whisk together all of the ingredients except the chocolate chips and pistachios. 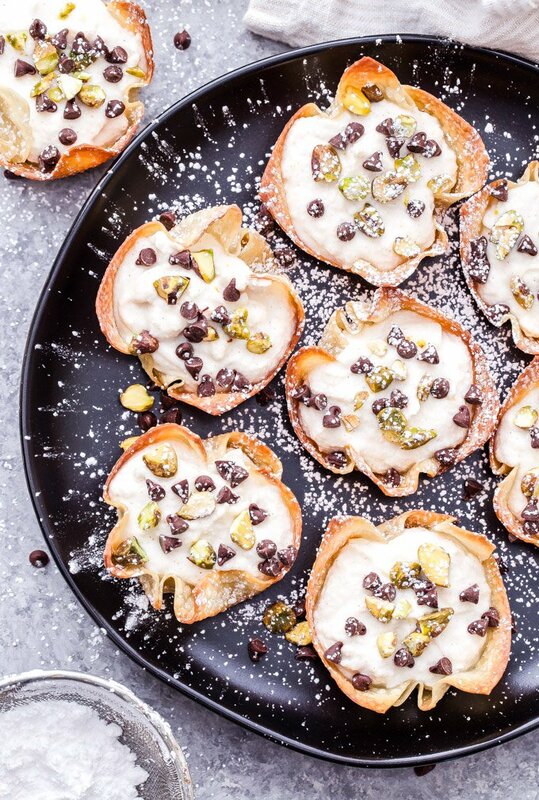 Divide the filling into the cooled wonton cups and top with mini chocolate chips and chopped pistachios. The wonton cups can be made in advance and stored in an airtight container. Don't fill them until ready to use or the filling will make them soft.